Pedro de Salvador Morell (wearing glasses and grey sweater) with Celia and Nod (far right). Making new friends has been an unexpected aspect of writing about living in rural Mallorca. Back in 2014 an English couple – readers of this blog – wrote to me with some questions about moving with pets to Mallorca. We were soon exchanging emails on a fairly regular basis and, when Celia and Nod visited the island to look for a property, we met for dinner – and hit it off immediately. They found a rural house to do up, although – unlike previous UK homes they’d completely renovated themselves – this one would be done by local builders. They invited us to see the place in its ‘raw’ state, shortly after they’d bought it and it was clear they knew exactly how they wanted it transformed. We have had personal experience of having an outhouse built, for our solar electricity components, at our Mallorcan finca – while we were still living in the UK. Unless you can live close by or on site (to keep an eye on progress) and speak enough Spanish to make your needs understood, it’s important to have someone managing the project for you. Celia and Nod have been very happy with the people working on their project. So much so that they invited us to meet the architect and two senior members of the building team, on the day they were cracking open a bottle of cava to celebrate the almost-completed project. 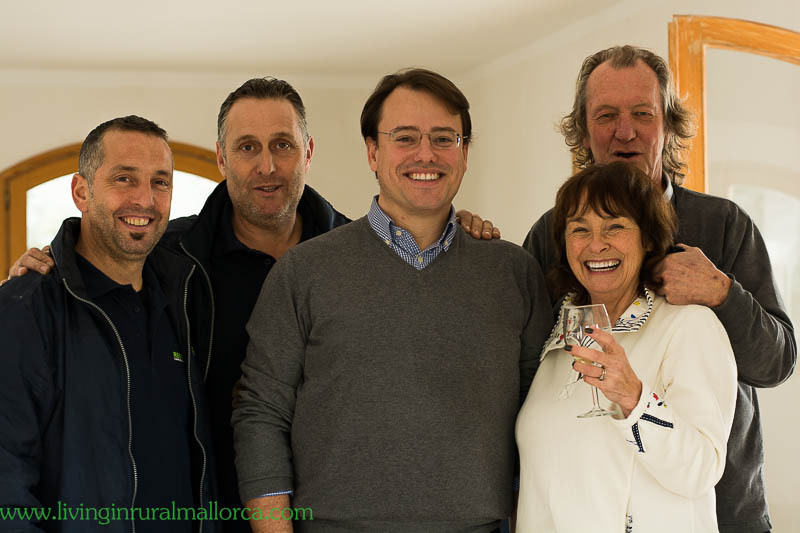 The property has gone through quite a transformation and this friendly couple is excited that it will soon become their permanent home on Mallorca. I took the opportunity to find out more about the services offered by Pedro de Salvador Morell of PS Arquitectos, based in Palma. For the record, most of his clients are British, Scandinavian, or German. Pedro speaks excellent English. What services do you offer foreigners investing in property on Mallorca? “Our office spans different aspects related to architecture and urbanism, in order to cover the broad needs of our clients. From our ‘Sale and Purchase Report’ – which is a useful tool to know the current state of the property and be able to negotiate the price – to architectural services, such as design, planning and project management, to achieve our clients’ dream house. “As architecture has three dimensions, we work with plans and 3D models, making it easier for clients to understand the design and ‘see’ the house even before work starts. What were the particular challenges of Celia and Nod’s house? In your opinion, what’s the biggest mistake that foreigners make when buying property on Mallorca? “Believing that it’s not necessary to take advice from local independent professionals (lawyer and architect) during the purchase process. On Mallorca there are professionals specializing in property purchase, and our experience and knowledge of construction and urban legalities allow us to reassure our clients regarding technical issues. What would you advise anyone thinking of buying a property to renovate on Mallorca? “Our recommendation to anyone buying a house here – to renovate or not – is to take advice from local independent professionals. Throughout our years of advising purchasers, we have noticed that no general conclusions can be deduced, as each building has its own history and particularities. “It is essential to check both the construction status and planning legality of the building, as those determine future building possibilities and, of course, the price itself. For instance, relating to the property’s construction status, there can be structural problems only noticeable by the trained eye of an architect, or construction issues that can affect renovation plans. In this sense, obtaining technical advice prior to the purchase – as Celia and Nod did – can help the purchaser visualize the future results of their purchase. And the history of your company? PS Arquitectos was established in 1980 by Pedro de Salvador, my father. After working some years in Barcelona, developing exclusive villas in Greece, I moved to Mallorca to work with PS Arquitectos. As architects, we guide our clients through all stages of the construction/renovation of a house, from the very beginning (prior to the purchase itself) to the work’s conclusion . . . so that the dream of living on Mallorca does not become a nightmare.